When it comes to how the future will look, most creators these days only show us how worse the world can get. This direction may be attributed to the decline of the environment and the primal predilection of man. Things don’t exactly look all that great for us. The stories usually involves zombies like The Walking Dead or the widening of the gap between the poor and rich like The Hunger Games. Rarely do they involve utopias as dystopias create the more interesting conflicts that drives our entertainment. The thing is there was a time and place where we looked to the stars and though of the possibilities. This is why Back to The Future II was one of the most indelible movies of 1980s and probably most talked about out of that franchise. It gave us hope of what the world could be. Utopias for some reason seem out of reach to the modern imagination. In the latest anthology form A Wave Blue World, All We Ever Wanted, we get several different visions of life in the future where life can be better. In “The Pilot,” a pilot controls a ship her VR glasses only to encounter an alien queen and her earthbound ally. In “The Weight of Time,” one scientist uses time travel to try and wipe out anti LGBTQ backlash but instead realizes the problem is actually ahead. In “Una,” an alien wins the hearts and minds of the citizens she protects, eventually becoming a citizen because of it. In “Seventeen Souls,” one hero risks it all to save one girl from certain death. In “It Looked like Our Dreams,” two siblings wonder about a future where humanity does save itself. In “Gaea,” mother nature and technology defeat an alien invader in which one protagonist uses to her advantage. In “Bombs Away,” a world is imagined where violence no longer leads to advantages or problem solving but unity as it was always intended. In “And The Rest Was Magic,” one woman finds out how it is when one doesn’t buy into the propaganda of a dire future. In “Everything I Own,” one self-admitted pariah slowly builds a community around herself while at the same time, evolving. In “The Inventor’s Daughter,” one woman reunites with her mother after death and returns her to the essence. In “Blackstar,” one man helps people see their future for a cost. In “Life’s A Devil’s Bargain,” one woman shows how hate is more of a choice than one realizes. In “Chat Room,” one awkward girl finds solace with a friend that met online. In “Can you See it Now,” one couple finds out an evil corporation is behind a friend’s death. In “Just Like Heaven,” one young man’s defiance leads to him finding out the secret to the utopia he is living in. In “Alternica,” a man wakes up from being frozen to a world where money doesn’t exist. In “Owning Up To The Past,” one man admits to his daughter, the unjust violence he committed. In “Good Time,” one man’s wish is to see his daughter years after he is released from jail. In “Day At The Park,” a young girl teaches a robot how to fly a kite. In “Choice,” one man designed a robot to have the power of free will, to only regret his decision immediately. In “Seeds,” the grim reaper reminds a retired superhero that there is more to life than regrets. In “Two Left Feet,” two thieves steal for the love of dance. Overall, the anthology is an excellent collection of stories that shows that the future can be bright and we all should wear shades. The stories are as diverse and extraordinary as each contributor showing off a wide range of voices and visions. The art by each creator is magnetic, alluring, and vivid. Altogether, the world needs more visions of utopias and this book more than proves it. Overall, the anthology is an excellent collection of stories that shows that the future can be bright and we all should wear shades. The story are as diverse and extraordinary as each contributor showing off a wide range of voices and visions. The art by each creator is magnetic, alluring, and vivid. Altogether, the world needs more visions of utopias and this book more than proves it. A Wave Blue World (AWBW), publisher of anthologies such as Broken Frontier, All We Ever Wanted: Stories of a Better World, and the upcoming Death of the Horror Anthology, announces they will send free digital copies of This Nightmare Kills Fascists and a special color version of the All We Ever Wanted ashcan edition to anyone who donates $15USD or more to Mark Waid‘s legal fundraiser. The longstanding comic book pro is currently being sued by one of the perceived leaders of the online harassment movement called ‘ComicsGate’. To fund his defense against the suit, Waid has launched a crowdfunding appeal on Go Fund Me. Curated and edited by Matt Miner (GWAR, Poser) and Eric Palicki (No Angel, Atlantis Wasn’t Built For Tourists), This Nightmare Kills Fascists is a horror anthology in the style of Creepy and Eerie, told against the backdrop of modern politics. It boasts stories from a plethora of hot creators including Vita Ayala, Tini Howard, Justin Jordan, Ariela Kristantina, Ryan Ferrier, and many, many more. All We Ever Wanted: Stories of a Better World is an upcoming anthology spearheaded by the same editorial team plus AWBW publisher Tyler Chin-Tanner that looks into a more hopeful and positive future, and has been described as “less Mad Max, more Star Trek.” Currently available to order in the October issue of Previews, the anthology is set to hit stores in December. The print version of the ashcan was an exclusive for NYCC ‘18, but can now be obtained digitally only by those who support this fund. It contains three of the stories from the anthology by creators Robbi Rodriguez, Tyler Chin-Tanner, Paul Allor, Juan Romera, Eric Palicki, and Eryk Donovan. Over his entire career, Mark Waid has always been a champion for creators’ rights and now he’s standing up for them against bullying and harassment. It’s important for us to come together now as a comics community to support him. If our fascist-smashing anthology can help Mark Waid fight against actual fascists in comics then I’m all for it. I stand with my LGBT family and trans friends in denouncing comicsgate and all the hate that they spew. I don’t know Mark personally, but I’ve followed his work for as long as I’ve been reading comics. It’s no surprise a writer who understands Superman or Daredevil so profoundly would devote so much of himself to standing up to real-life bullies, and I’m proud to help Mark in any way I can. 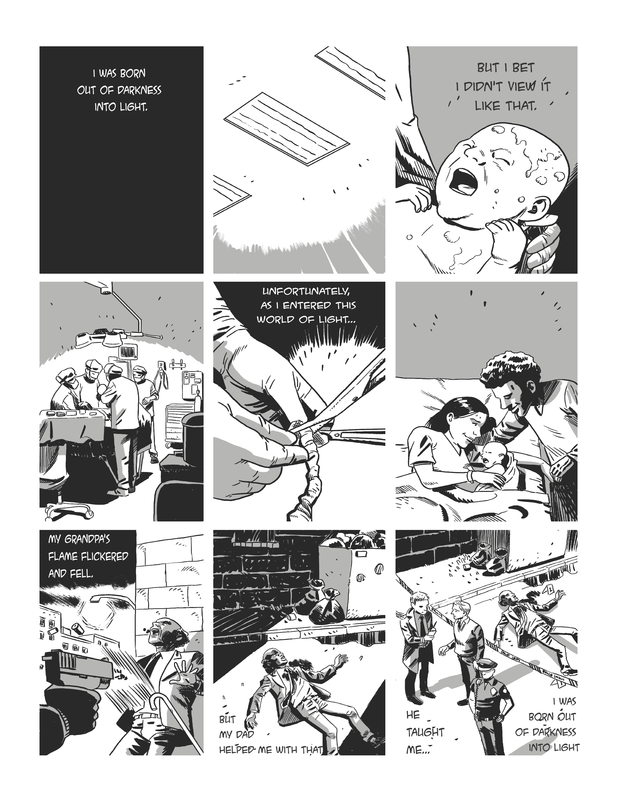 To obtain the PDFs for This Nightmare Kills Fascists and the All We Ever Wanted ashcan, please send a screenshot of your receipt of your donation of $15USD or more to Mark Waid’s fundraiser to tyler@awbw.com. In today’s segment, I walk you through how I found the perfect artist for Rebirth of the Gangster, Juan Romera! Now that I had my story and script ready to go, I started looking for an artist. Yes, I realize that the best scripts are tailored to an artist, but as you will see (or have already seen), I sometimes go about things in a backwards way. What good is creating your own stuff if you can’t set the rules, am I right? I had a few guidelines in mind: I wanted an artist who wasn’t overly detailed, but could bring the heat when it came to creating character expressions. A lot of this comic is reliant on the “acting” of the characters and the reader inferring things, rather than me just telling them. Note–there is more telling and exposition in the first issue than the later ones will have, but that’s often the case with a first chapter or scene. I also knew that I wanted an artist who could play with shading and grab the reader with just black and white. Part of that, to be honest, is an issue of funds–everywhere I looked, artist’s price for coloring their pages was out of my budget. I also like to think, though, that black and white suit this story even better. It creates the noir atmosphere and tonally helps emphasize some of the thematic concerns, especially ones dealing with race and class. Both of these artists were advertising themselves on a “Seeking Comics Artists/Writers” forum, found on zwol.org. The forum’s title gives you a clear idea of what it is for, but there are other comic creators that advertise themselves, like colorists or letterers (like I advertise my letterer service on that forum here). The European-based artist had some things going for him, but I thought some of his storytelling and character work could get a little too abstract, so I couldn’t justify his extra cost, especially once I saw some of the sketches that Juan did for me, based off these character descriptions. Hair–Black hair. Curly hair, but we barely notice it because his hair is cut very short. Clothes–He’s a lawyer, so he’s often dressed in ties and suits or in other fancy attire: button up shirt, dress shoes, and khakis/black slacks. He’ll be in a tux in the first scene. Other general appearance: He’s lived a clean life, so he’s fit (not overly muscled, but toned). He’s professional looking, but often happy (or at least he looks happy–he focuses a lot on having a good appearance). Hair–Long, brown hair. It’s almost shoulder length and is mainly straight, not curly. A little messy. Clothes–He’s mainly wearing jeans, tennis shoes, and sweat shirts/flannel shirts. Other general appearance: He’s a heavy drug user and drinker, so he’ll look older than Marcus (baggier eyes, more wrinkles, and his teeth are a little yellower). He also has a little pot belly (not so big that he’s fat, but you can see that he drinks a lot, eats poorly, and doesn’t exercise a lot). He’s mainly looks a little anxious, depressed and angry. Every now and then, he’ll be happy, but that will mainly be when he’s high or drunk, escaping his stressful life with chemicals. Hair–Black hair that’s straight and just a little past shoulder length. Clothes–She’s a detective, so she’s often dressed in suits. Her suit is a little wrinkled and of poorer quality than Marcus’s suit; she also doesn’t wear a tie (or if she does, it’s only loosely tied, there only for appearances). When she’s off duty, she wears jeans, tennis shoes, and plain, long-sleeve shirts. Other general appearance: Like Marcus, she’s mainly lived a clean life. She’s fit, but has a few more wrinkles and bags under her eyes than Marcus, because of her stress growing up. She can look serious to people that don’t know her but nice to those that do. We know we don’t want to mess with her, but we also know that there’s nobody else we want on our side. Hair–Short, black hair. Not quite shoulder length, but not so short that she’s “looking like a man”. Clothes–She wears blouses, fancy slacks, and high heels. In the opening scene, she’s wearing a fancy dress. Other general appearance: She’s really pretty, but you can also tell that she has an edge to her, a hard side (dark side). Like Marcus, she also mainly puts on a happy face for appearances. As the story progresses, though, she’ll start looking tougher and more serious. And after further thought, I’d like the character design of Andrea to still have black hair, not white. She’s going to be a badass and I think it’ll be easier to sell if she’s not too “old looking”. It’ll also match the flashback and make it easier to transition from past to present. Sorry to keep flooding you with feedback. If, because of all the emails and changes, it’s a little confusing, I can send you one email to look at for my feedback. I didn’t know how I lucked out to get both of my major needs met, but I didn’t want to waste time and let Juan slip away to some other lucky writer. So I agreed to work with Juan, and haven’t looked back. A month or so ago, I wrote a broad overview about the inspirations for Rebirth of the Gangster, the comic that I write with artist extraordinaire Juan Romera. I got so much good feedback from that article that I decided to keep up the behind the scenes look at my crime comic, but I thought I’d twist the concept and get into the nitty-gritty, the nuts-and-bolts of actually making a comic, not just the inspiration behind it. In short, this series will tackle the blood, sweat and tears part of creating a comic, not just the childhood seeds that eventually bore fruit. A while back I wrote a poem as a model for my students (I’m a high school English teacher if you didn’t know). I no longer remember what lesson this poem was for, but I became obsessed with the themes it established. I also wanted to know more about who the narrator was, and where he would go with his life after being “born out of darkness”. Would he really find the light? Who or what was responsible for creating that darkness in the first place? Below is the poem I created, which I adapted, more concisely, to start the comic (compare the poem to the first page, which I’ve attached shortly after the poem). But I bet I didn’t view my birth with such optimism. reeled at the excitement of a new world. like a rabbit dodging birds of prey. I was born out of darkness into light. As you can see from the “Prologue” and first chapter title, I always intended to use this piece in a longer work. However, my plan was to make a sweeping historical novel centering around two families during the Great Depression (the Marcus character would be white and rich, and the Hunter character would be black and poor). Clearly that’s not how it’s playing out in the comic. I thought it might be too stereotypical, so I switched the race of the narrators to make it more unique and I brought it to present day to make it more relevant. Other writers might be able to start with a spark of an idea and improvise as they write. Not me. Or at least, not me at this stage of my career. I found that I need a very detailed layout of the story before I even start it. This isn’t to say that I will follow that outline completely, but I need it to have a clear picture of where I’m going. And besides, I’ve found that having that outline in place has freed me up to be flexible, ironically: it’s easier for me to adjust if I know the rest of the skeleton is intact, and if I know where I need to bring a story element back into the bigger picture. I also realized that I loved writing for comics. I mean, it shouldn’t really have been a surprise, since I’ve read comics obsessively since I got a Christmas gift of 30 X-Men comics from my parents, but I had been stuck on this idea of establishing my literary merit with a novel before switching to comics. I had the mindset I’d often raved against: that comics can’t be seen as serious literature. (Don’t worry–I don’t believe that now, and I didn’t really believe it wholeheartedly then. I was just letting fear run my life more). When it came to adapting this poem to the first page, I quickly realized it was too wordy, especially once I saw Juan’s great storytelling ability. Below, you can see the complete page where I’ve bolded the lines that were deleted. As they say when revising, “Murder your darlings”, and that’s exactly what it felt like. But I think it made the comic better and more concise. Decide for yourself though, and compare the comic page with the first draft of the script for that page that follows. MY NAME, ADDRESS, AND CONTACT INFO WAS HERE. Panel 1. We open on a completely black panel, starting our story the way all our stories start: in darkness. This page will be a flashback. We’ll have a lot of these flashbacks throughout this story, so it would help if you manage to visually separate these pages and panels from the rest of the piece, either by having a different style or even something as simple as creating a different outline for the panel borders. Panel 2. The fluorescent glare of hospital lights shines through and breaks the darkness. We see these lights, the ceiling, and that’s it; we’re essentially taking on the perspective of the narrator as a new-born baby. Panel 3. Now we’ve shifted out of that perspective and are looking down on Marcus, the new-born baby. A close-up of a screaming baby shakes the borders of this panel. Panel 4. We’ve widened our camera angle to see the thrum of a busy hospital room. Doctor and nurse hover near the hospital bed, standard birthing accessories/machines wait for the next birth, and Marcus’s mom and dad hold him, welcoming him into their lives. Panel 5. Zoom in on a scissors snipping an umbilical cord. Panel 6. This panel is similar to panel 4, but now we’ve completely zoomed in on Marcus being held by his mom and dad. Like all new parents, love radiates from them and his mom’s eyes water. Marcus continues to howl. Panel 7. We shift scenes (keeping the voiceover from Marcus). Now, we’re on the streets of Madison, WI at night. On the left side of the panel, hands holding a gun creep onto the panel. The hands clutch the gun as it blasts a few shots, attacker knowing how to prep for the recoil. On the right side of the panel we see the target of this gunshot: an old, black man (Marcus’ grandfather). He’s wearing a suit, newly bought. He’s pushed back by the force of the gunshots, flailing as his feet leave the ground. Panel 8. We’re at the same scene as panel 7, but time has passed, the murder has been discovered, the body is gone, and all we see is a chalk outline of the grandfather’s body. It’s still night, but we can see this area more illuminated than in panel 7; flashlight beams cut across the chalk outline and this panel. Panel 9. We’re at the same scene as panel 8, but now we’re panning out to seeing the area surrounding this chalk outline. We still see the outline, but it’s crowded by police tape and cops talking with each other and with witnesses. Their flashlights still shine against the darkness. There will be two captions in this panel: the first one will be at the top of this panel and the second will be at the bottom. *Note* To see more behind the scenes, check out “First Shot: The Making of Rebirth of the Gangster“ for sale on Amazon! And stay tuned for more posts on creating the comic: I’ll cover writing the script, finding the artist, communicating with the artist, lettering the art, and the all-important process of submitting a comic to publishers, plus revising based on feedback. Until I shine the light on this process again, good luck in the dark! 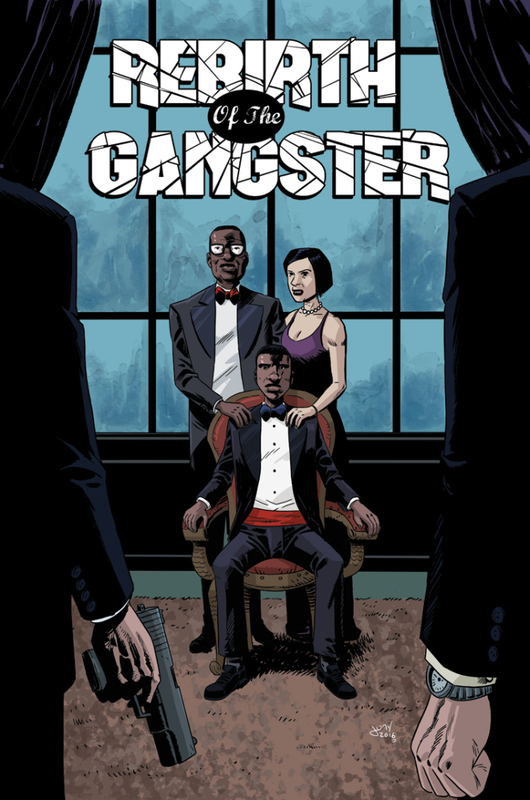 Rebirth of the Gangster is described as “a crime, family-driven drama that mixes elements from Othello, Breaking Bad, The Wire, 100 Bullets, and Criminal.” That’s a lot of awesome to live up to, and the first issue sets up a series that definitely falls into the intriguing end of things. Written by CJ Standal with art by Juan Romera, the first issue is exactly what I look for when checking indie comics and it’s a genre I personally enjoy, a crime/gangster story with a focus on the characters instead of the violence. While Standal mentions a lot of pop culture in his pitch for the series, one that’s not mentioned is The Godfather, and with some scenes and the talk of honoring one’s family, I feel out of the crime stories mentioned that is one that has the most influence in this first issue. Standal also has a diverse cast with the main focus on Marcus, a rich black lawyer, and Hunter, a poor white blue collar worker. Both of their moms will play heavily into the story–Marcus’s mom is a first generation Hmong-American, and part of her story will focus on that struggle. The two main antagonists to Marcus and Hunter will be Lorena and Kaitlyn. Lorena is a homosexual, Latina cop who grew up in the inner city and struggled with her faith, her sexuality and getting out of the hood. Kaitlyn is a black lawyer who works with Marcus, and she comes from a more privileged background than Lorena. Lizzeth, a Latina teacher; Dennis, a white man just released from prison; and Devonte, a black man wrongfully imprisoned, close out the rest of our cast of characters. While their story lines might start out separate from Hunter and Marcus, all the characters and story lines will converge. With an interesting cast, someone for everyone, Standal does an excellent job introducing us to some of the characters making sure to give us a lot of depth to flesh them out. Hopefully this is a standard for the series as we rarely see comics written with that as such a focus. Romera’s art brings it all to life and with a diverse cast, we also get diverse looks. Each character is unique in that department which is fantastic to see. Everyone is identifiable and standard cookie cutter designs that are used over and over between different characters are nowhere to be seen. So, good story? Check. Diverse cast? Check. Solid art? Check. This is a comic to check out and support. A Kickstarter for the second issues is currently running through Sunday. CJ Standal grew up reading comics, probably to an obsessive degree. But he didn’t get stuck in the insulated world of comics culture. As an English teacher and History major, he’s always been interested in all sorts of stories and societies, using books, movies, music, and experiences of all kinds to break free from the panels confining comics’ culture, while still paying homage to its great history. And this is a perspective he brings to anything he creates, especially his first comic Rebirth of the Gangster. Rebirth of the Gangster is a crime, family-driven drama that mixes elements from hip hop, punk rock, Othello, Breaking Bad, The Wire, 100 Bullets, and Criminal. The first issue was already released March 23, 2016, which can be found on Amazon. The Kickstarter is raising $1,000 for the second issue. All of the proceeds from the Kickstarter campaign will go to paying Juan Romera for his art and to mailing the few physical rewards. Some reward highlights include personalized sketches from Juan, interviews/podcast appearances by CJ, 50 pages chronicling “The Making of Rebirth of the Gangster”, a cameo in the second issue, and more! Rebirth of the Gangster covers a huge cast of characters, painting each one as the hero of their own story. So far it has focused mainly on Marcus Thompson, but like The Wire, The Walking Dead, and Game of Thrones, its focus will only continue to expand, giving readers plenty of characters to relate to and root for. As it continues to expand, readers will also see that it’s extraordinarily relevant, focusing on issues of race, class, sexuality, and flaws in our justice system. Marcus Thompson, son of the rich mogul Curtis Thompson, is a successful African American prosecutor struggling with his job, especially the unfair treatment he sees happening to minorities and poor people. He’s also haunted by the suspicious death of his grandfather and a recent robbery he witnessed. Although Marcus doesn’t know it, he was robbed by Hunter Anderson, a poor white blue collar worker, who is mysteriously connected to Marcus’s dad Curtis. Hunter was sucked into this life of crime because of the medical bills for his dying mom and the reality of growing up without a dad–his dad was also killed under suspicious circumstances. Lorena Sanchez is a cop who grew up in Hunter’s neighborhood and almost joined him in a life of crime. After struggling with her faith and the discrimination for many reasons, including being gay, she decided to police the same types of neighborhoods she grew up in, hoping to help people avoid her own mistakes. And she’s recently been investigating a string of robberies that have deep connections to Hunter, and shortly, to Marcus. Andrea, Marcus’s mom, and Linda, Hunter’s mom, both are hiding secrets from the past. But these secrets look like they’re about to see the light of day, and they’re trying to protect their sons from these secrets and the past mistakes they’ve made. Adding to these characters we’ll see Lizzeth, a Latina teacher; Dennis, a white man just released from prison, trying to avoid his past mistakes; and Devonte, a black man wrongfully imprisoned. According to CJ Standal, “All of the funds raised for this project will go to pay Juan for his work (and to the small amount I’ll have to pay to mail the sketch rewards). I don’t want to make Juan a starving artist, and if you’re on this website, I’m sure you agree with me. The Kickstarter will end on May 15 at 3:30 pm. Please consider supporting a new voice to comics and a groundbreaking new series! Possessed with the souls of four wronged spirits, a troubled young boy has to extract revenge on their behalves before he can finally lead a normal life. Written by B. Alex Thompson, The Vessel Vol. 1 takes some inspiration from folklore, and spiritualism It’s an interesting read to say the least. Adding in some revenge based violence, the story is clearly aimed at adults. While I could say more, but that would spoil the well written story. While the prologue artwork is more vibrant in its use of color, the actual story is dark. The artists, CJ Camba, Amanda Goebel, and Juan Romera, did a great job to emphasize that as the story unfolds. Yet they still manage to balance the occasional light-hearted moments, as the violence and the acts of revenge get increasingly more brutal. It is obvious that those involved feel great pain, as their various crimes come back to get revenge. I am a huge movie buff, as can be ascertained by my previous postings. One of my favorite movies of all time is All The President’s Men, where an intrepid pair of reporters uncovers a huge conspiracy, involving shredding and government employees. Many movies, tried to capture the same intrigue, as this classic film, the most recent being, Kill The Messenger, but none have even come close. That search, ended with Strange Nation, which plays about upon similar machinations but in a fun and suspenseful way. The comic centers on Norma Park, a former investigative reporter, who lost her job when she uncovered corruption involving politicians. Now she is on her own, still pursuing the same story with the help of a weird sidekick. This has got be one of the weirdest conspiracies, involving aliens, doomsday cults and ape men, thus accentuating the “strange” of Strange Nation. One that any tabloid would be happy to run, which is the reason why Norma got fired. The story delves into Norma’s personal history as well as personal life, revealing multilayered protagonist, one of the better developed female lead characters I have ever seen. The story also has all the quintessential tropes of a good crime noir novel, allowing murder mystery to occupy the same space as aliens. Eventually, Norma meets Dr. Milo, the main antagonist, and finally finds that truth for which she almost lost everything for. The story arc ends with the revelation of an impending war. Overall, a fun story that makes light of tabloids and has all the fun quirks of a great Doctor Who episode. Paul Allor’s story is a fun trip down the supermarket aisle where all these creatures exist in those tabloid newspapers. The art by Juan Romera provides enough texture and allure to enhance the noir-ish style story the collaboration is aiming for. Ultimately, this story is a fun mix of Roswell and Manchurian Candidate, definitely worth a read.